Investing a mattress usually accounts for a large amount of money. A good quality mattress can cost over $1000. This is well worth your expense if you will be sleeping on it every night. But, if you are just planning on using it occasionally, this turns out to be a waste. That being said, this is the primary reason for people go for folding mattresses. It is many times cheaper than a regular mattress. Other reasons making folding mattresses are highly preferred than others types of mattress can include the convenience in usage and storage, possibility of becoming a sofa, and camping mattress. The fact is there are plenty of options for when it comes to shopping folding mattresses. This makes you overwhelming. So, how to choose a best folding mattress that suits your needs, and your budget? 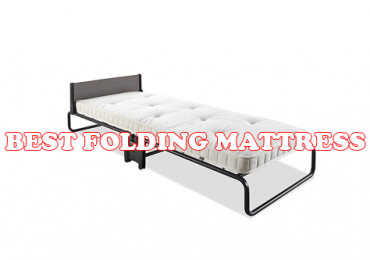 To help you hunt for the right choice, we offer you a list of best foldable mattress as the following list. Hopefully, they are helpful in your hunt. We are just publish article about bamboo mattress, check here. What the materials the constructions is made from and how it is constructed determine your comfort while sleeping on the mattress. 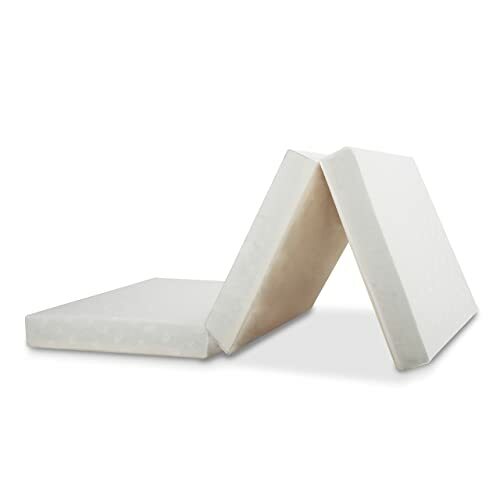 Most folding mattresses are constructed from memory foam and regular foams. Usually, the foams chosen for making the construction are poor quality as compared to foams used in unfolding mattresses. This results in too stiff feel, but the benefit is low in price. As a tip for choosing the most comfortable and greatest feel, the construction built from different layers of foam is often better than those made of single piece of foam. It has the nicer cushion while still firm to not bottom out easily. Meanwhile, the latter is often too stiff. But, this is a very subjective opinion and doesn’t guarantee for all cases. The cover is the thing to protect the core and which you will accumulate dust and stains. That being said, it is better to have removable and washable cover. Hence, you can bring it to cleaning easily. Meanwhile, if having an outer cover that is stitched directly on the cover, you may need an extra cover to protect it. It is certain to cost you extra money as well. Lastly, mostly, the covers of folding mattresses are fairly thin and easy to be ripped, finding a thick and durable one isn’t easy. The size of a mattress will determine how comfortable you are in all sleeping positions. The fact is many models aren’t wide enough in width or long enough in length. In general, if a size of a folding mattress equals a twin sized mattress, it will be perfect to choose. Approximately, it is 39 inches in width and 75 inches in length. If you are a picky buyer, the list of the factors to consider keeps going on. It can be the solutions for heat retention of memory foam like gel infusion or ventilated foams. 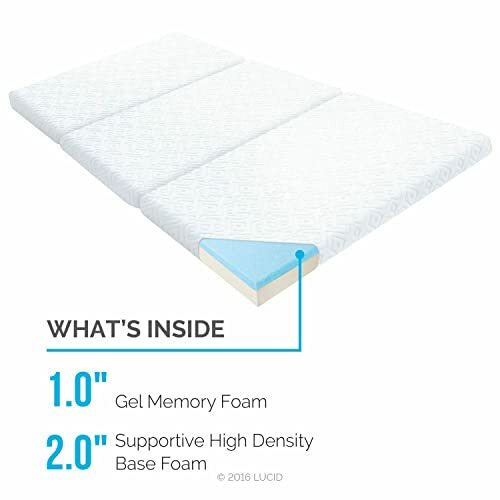 In terms of heat retention, it exists that there are gel infused memory foam folding mattresses available in the market, but they aren’t as many as found in unfolding mattresses. For ventilated foams found in folding mattresses, it seems to be rare to see advertisements of folding mattresses claim this. Additionally, thickness and firmness are other factors you can consider before choosing. These things are often officially published on the web where it is sold online. So, it isn’t difficult to find them out. How thick you prefer will depend on your preference. As my personal tips, for camping mattresses, it should be somewhere from 3 – 5 inches in thickness, so as it can be lighter in weight and less bulky for transportation. If you just plan on investing a mattress for your overnight guests and won’t have the needs to relocate it a lot, thicker mattresses would be also ideal to sleep on the floor. Note: I name the regular mattresses as unfolding mattresses (types we use to place over our bed), this comes as the way to distinguish between folding mattress and the regular mattress. Foldable mattresses come in plenty of models. Mostly, they are designed as tri-fold mattresses, and can be set up to become a sofa. The fact is they don’t come in the same size, material and price. Aside from these, how each mattress performs while sleeping or sitting on is also different. With that being said, this following list of best folding mattress is hand-picked. That means the chosen ones must be those that have gotten the plenty of feedbacks of the customers. We picked these feedbacks from some online shopping sites. 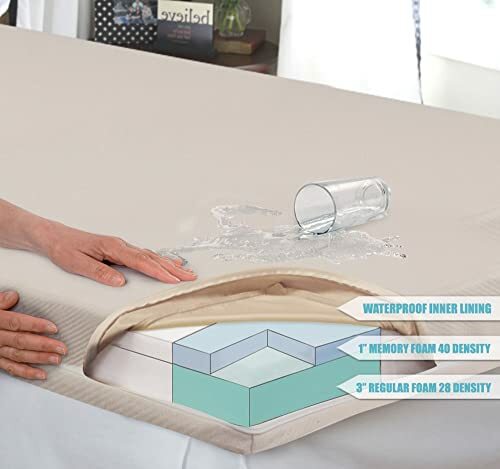 If you are looking for an ideal solution for temporary sleeping accommodations, the Milliard Memory Foam Tri-fold Mattress is worth your consideration. This is the best mix of quality construction, comfort and support. The mattress is built of 1.5in. of 3lb luxurious memory foam placed over a 4.5 inch supportive foam base. All layers form to 6 inches in total thickness. This thickness ensures a good support and prevent from bottoming out quickly. Along with that, the foam is high quality to provide a great comfort when lying or sitting. In addition, the mattress comes with removable jacquard ultra-soft bamboo cover with anti-slip bottom. And, the bottom fabric is a darker, more durable type. This aims to provide a good protector to the core and adds an extra comfort for users. The mattress is fairly firm, which helps itself possible to hold heavy people and fit the needs of back and stomach sleepers. More importantly, it won’t easily become flattened or bottomed out. When lying, you won’t feel the solid floor underneath. However, this firmness may be not ideal for those loving plush feel when sleeping. There is no hassle when needing to turn it into a sofa. It is easy to set up, or opening or folding. The weight of this mattress isn’t too heavy for a person to deal with. Moreover, it doesn’t take up much space after being folded, so it solves the problem of not having a large room placing furniture. All these facts just emphasizes that Milliard 6-Inch Memory Foam Tri-fold Mattress is easy to use. Who might Need this Mattress? Deciding on purchasing a mattress on tight budget may usually lead to hardly making a final decision. You may feel skeptical about its quality. That being said, our list aims to reduce that common issue when shopping a best foldable mattress. I just try to say this D&D Futon Furniture Tri-fold Foldable Bed may make you surprised. You can check top best futon mattress here. The construction is made of 1 type of high density foam with 1.8 pounds. This foam can provide a good cushion and enough comfort when you are lying. It just comes with 3 inches in total thickness, but it is sturdy, and firm. However, the thing may make you disappointed a bit is the small size of D&D Futon Furniture. With the measurements: 3″ thick x 27″ wide x 75″ long. The length is as long as an unfolding twin sized mattresses available in the market. Hence, It might be a bit small to fit perfectly a big guy. The thickness of D&D Futon Furniture Tri-fold Foldable Bed may be not ideal to sleep on the floor, but it doesn’t affect the ability to hold sleepers. That’s because it has a good firmness. This doesn’t guarantee it from being bottomed when using under constantly vigorous pressures. But, it is able to prevent from bottoming quickly and you don’t feel the floor if sleeping on it occasionally. The mattress is light in weight and the mattress can be folded neatly. This makes it easily transportable and put away when not in use. Is it practical to be carried for travelling? The answer is yes. It won’t be bulky to carry with you when travelling. Who may Need this Mattress? 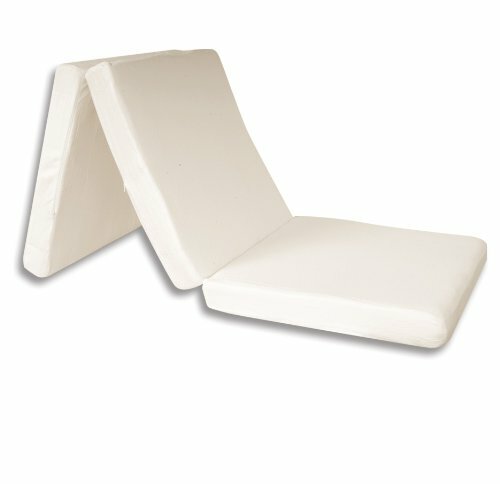 Who are looking for a folding mattress on tight budget? Can choosing a cheap folding mattress from a well-known mattress company make you less skeptical about its quality? It is hard to answer, right? But, let’s look at the details of this Zinus folding mattress! 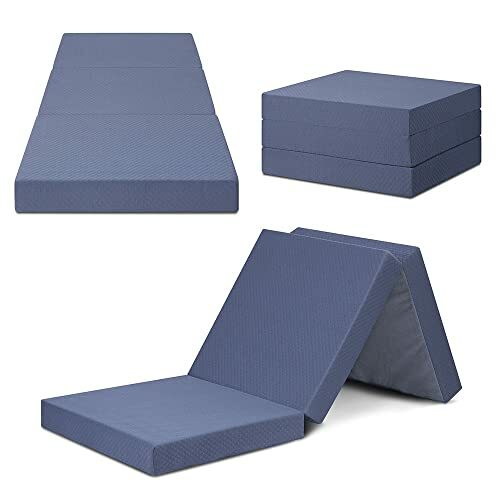 Instead of having a simple construction like other competitions, this foldable mattress is constructed from three foam layers that work together for great comfort, including 1 inch Memory Foam, 2 inches Viscolatex Responsive Foam, 1 inch High-density Base Support Foam. This design is similar to unfolding mattresses we use. That means it doesn’t bring cheap feels when sleeping on this mattress. Additionally, the cover is generally nice in feel. However, it is fairly thin and too tight. Plus, the seams are easy to tear. So, for those who who’s extremely concerned about a removable cover for cleanliness, you can find an extra cover for it. With the size of 6 feet long by 3.25 feet wide, it fits the twin sheet perfectly. For sleeping, the mattress is roomy for an adult to comfortably sleep in all positions. In addition, Due to this unique construction, it has a nice contour and hug, thanks to memory foam. Along with that, it can response to the pressures quickly due to the visco latex. Overall, the feels of the mattress is good and can please all types of sleepers. Lastly, if you are not a type of heavy person, the mattress doesn’t let you feel the floor. 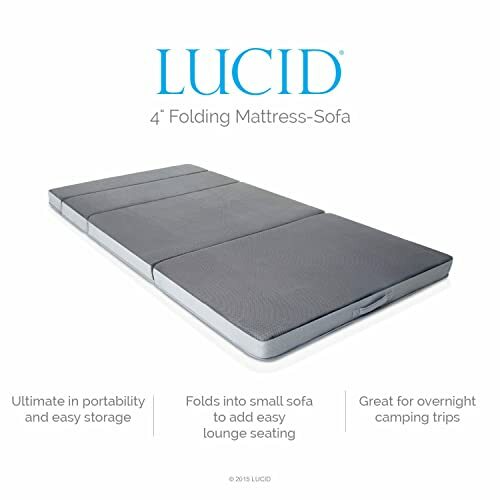 Foldable mattresses that allow using in two mainly different styles like this Lucid is very convenient in many ways. It can be used as a temporary bed at night when you have guest coming over your house. When the morning comes, you can re-setup it to form sofa for lounging and sitting. 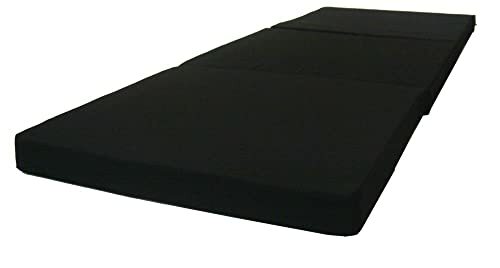 The foam used for the construction is 0.5 inch memory foam combined with a 3.5 inch layer made from high-density supportive foam. In addition, it comes with a washable and removable cover, making it easier for cleaning. More especially, the cover is breathable, reducing the heat retention for the mattress. More ideally, the handle comes as a handy thing for removing or transporting somewhere. This foam can provide a nice cushion when sitting and lounging. You are easy to feel the softness of the foam right from the initial touch. However, for those who prefer plush feel rather than firm feel, this Lucid mattress may not provide a comfortable level of firmness. It just means it’s too firm a bit. The nice thing is you won’t feel the floor. Ideally, you won’t have to worry about the limited option for size when choosing this folding mattress from Lucid. That’s because it is available in five different sizes, including: Twin, Twin XL, Full, Full XL, and Queen. The multiple options make it convenient to choose the right one of your own need. This tri-fold mattress from Best Price is the next one worth your consideration. It comes at reasonable price but has many great features. The construction is made of 1.5″ of memory foam combined with 2.5″of high-density base foam, forming 4 inches in total thickness. The foams chosen are fairly good enough to ensure the durability with constant uses in different situations. In addition, it comes with 100% poly-Jacquard zippered cover with slip-proof bottom. The cover is thin and nice to touch plus, it is also machine washable, making it easy to clean. This cover is thin nice to touch. In general, the mattress can make you feel fairly comfortable. The memory foam is soft for becoming a great cushion. It isn’t too thin and too soft to make you feel the floor. Hence, it can be used as folding bed excellently. However, as many foams, the mattress tends to absorb heat and produce warm feeling. It is normal to smell odor after memory foam mattresses are first unpacked. But, it needs to disappear within a few days later in order to sleep comfortable. To solve that problem, this tri-fold mattress has been infused with ActivFRESH charcoals to maintain freshness. Hence, you won’t feel any odors contained in the mattress. In addition, the mattress comes with a zippered outer cover. The fabric of the cover is soft, and highly breathable. Along with that, the zippered cover is very well made and can be removed to clean it easily. More especially, it can be washed with machine and detergent. So, if this is a big concern when choosing a folding mattress, you can feel happy with this fact. In general, this folding mattress is very comfortable to sleep on. The foams work well together in providing great comfort and support. Though, it is designed with 3 inches in thickness, fairly thin to sleep directly to the floor, it isn’t easy to feel the floor underneath. In addition, having gel infusion makes this Lucid mattress stand out from the crowd. It reduces significantly the heat retention in memory foam. So, you will feel cool all night long. Along with that, the breathable fabric cover also adds the cooling feel for the mattress, and enhances the comfort for sleepers. Who May Need this Lucid Mattress? The next tri-fold mattress worth considering has a name FoldNGo Adult Single memory foam mattress. Before deciding on choosing it or not, let’s give a look at its details! The mattress comes in 4 inches in thickness, which is usually seen in folding mattress available in the market. The construction includes 1″ 40 density orthopedic memory foam + 3″ 28 density foam base. In addition, it also has a removable machine washable polyester cover. However, the fabric used for cover doesn’t the cheap look and it is fairly thin. Basically, it is not bad for itself to serve as a temporary bed, which you intend to use occasionally. The memory foam used can provide the nice cushion when put your body on. And, more especially, the mattress is firm to prevent the bottoming in short time after being unpacked. However, the odor is fairly strong, which may remain for a week to be completely gone away. If you don’t feel too concerned about this issue, it is generally convenient to have it at home and use for travelling. That’s because it can be set up quickly and light in weight for a person to deal with when moving it from this place to that place in your house. Who May Need this FoldNGo Mattress? What about a mattress made in USA? It definitely gains more trust in quality, right? 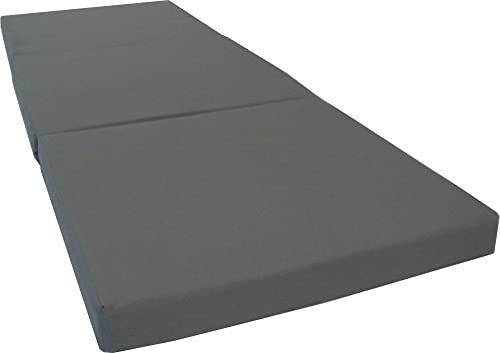 The fact is this Brand New Gray Shikibuton Trifold Foam Beds is manufactured in USA. Let’s see its details! The construction is simply made of single layer of foam, which has 1.8 lbs high density. It is wrapped by a 100% Polyester poplin fabric. Unlike other tri-fold mattresses, the cover of this mattress is completely stitched to the foam. Hence, you can’t take it off for cleaning or replacing. However, you can totally by a separate cover for protecting it. How thick this mattress is? The total thickness comes in 3 inches. It may be still thin for some to place directly to the floor. But, if this mattress is being planned on using occasionally like having guest coming over, or camping, it is durable to last more than one year without bottoming out or flattening out. The firmness of this mattress comes as medium level. It depends who will be sleeping on it, the pressures placed on it will be different. If you are person with average weight, this mattress can stay good and won’t feel the floor. For the storage, it can be folded up easily and turned into a neat shape to keep hidden away when not in use. One note of caution, the size of the mattress is quite narrow to comfortably lay on. The length is alright for an adult, but the width is equal to a standard twin bed mattress. it is narrower than twin bed frame. Who May Need this Brand New Gray Shikibuton Mattress? Olee Sleep is one the popular name when it comes to shopping mattresses online. With this tri-folding mattress, it can catch your love from first sight. That’s because it has a good-looking and sturdy look. Let’s discover more! The Olee Sleep mattress is designed 1.5 inches of gel memory foam over 2.5 inches of regular foam, totaling 4 inches in thickness. The construction is well built and very durable. Even you can feel it by looking with bare eyes. It does also come with Removable Cover along with Zipper System. More especially, the fabric used for cover looks fairly thick and durable. This is rare to see due to the cheap price. And, it makes it special and more outstanding because most tri-folding mattresses available in the market are included a thin and poor quality cover. Good quality foams makes good construction and then provides a great comfort when sleeping on. It is certain. The medium firmness of this mattress will allow your body sink into the mattress, but not feel the floor. For those who are wondering whether this mattress contains odor. The answer is it smells slightly, but won’t remain forever. The smell is even less overpowering than any cheap folding mattresses. Who May Need This Olee Sleep Mattress? 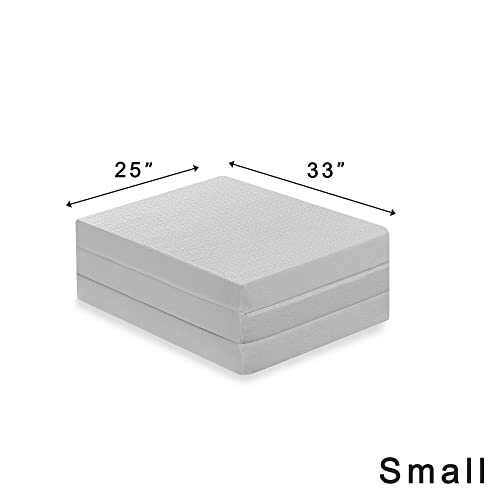 The construction of Innovex mattress consists of two different layers of foam, totaling 4 inches in thickness. It includes s a 3-inch support foam base and a 1-inch Memory foam layer. They combine together to provide a maximum comfort. For the cover, it is removable, washable, and water-resistant, which helps you easier to throw it on the washing machine. The overall feel of this Innovex mattress is soft to touch and comfy to stay on all night long. It doesn’t make you feel too stiff like many tri-fold mattresses out there. The firmness can prevent you from bottoming quickly. 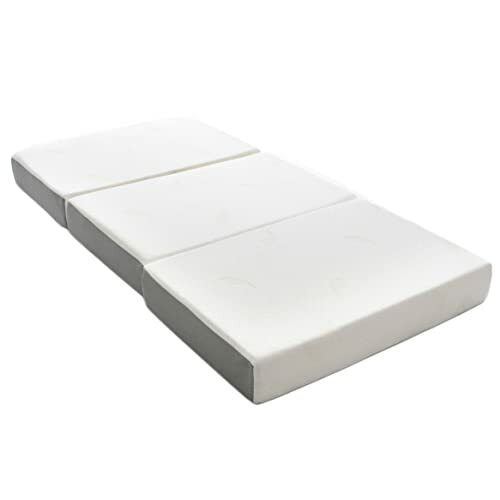 More importantly, the firmness is comfortable for back pain sleepers. Certainly, too frequent use can lead to bottoming. It depends how you are going to abuse it, but if you just use it occasionally during the year, it totally remains fine. However, having no cooling gel infusion may be lead to heat retention. It can be unbearable during the summer time. To come to inclusion, the overall feel is good. Who May Need this Innovex Mattress? Hopefully with the top 10 best folding mattress that we have reviewed above, will help you find a product that fits your needs and budget.